United Airlines is its own worst enemy. They need help. I have offered. You've probably seen the video of the United Airline's passenger being forcibly removed from an aircraft bound for Louisville. The airline said in a statement that the flight was overbooked, and that no passengers agreed to voluntarily give up their seats. United said airline representatives randomly chose four passengers to leave the plane, and that one man selected refused to leave his seat. Officials then requested the assistance of law enforcement, who forcibly removed the man. The seats were being cleared for airline employees on standby who were needed by the airline for shifts in Louisville. After the leggings incident of three weeks ago, United Airlines is looking as bad as an airline can. 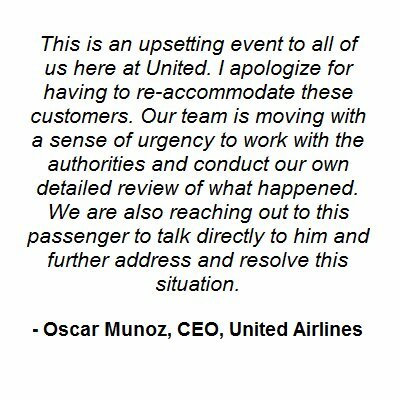 United Airlines CEO released a statement regarding the incident. It's a disaster. "I apologize for having to re-accommodate these customers?" The whole statement is awful. It's worse than meaningless corporate talk. It's mealy-mouthed cowardice that only serves to perpetuate the story by introducing the world to the phrase "re-accommodate passengers." The Internet is having a field day with this one. Some may argue that a statement like this would expose the company to a lawsuit. I'm quite certain that United Airlines exposed themselves to a lawsuit when they chose to forcibly remove that passenger from the plane. That cat is out of the bag already. But even if this statement makes it more difficult to defend a potential lawsuit, the money saved in goodwill and a demonstration of actual leadership would more than make up for the settlement costs. United Airlines reported offered $800 in travel vouchers, and it was only after this offer was rejected that they began randomly removing passengers. Rather than offering $1,000, $1,500, or more in order to entice passengers to be bumped, now they have this. United Airlines has a market cap of $22.7 billion. In an attempt to save a couple thousand dollars, they have instead produced video footage that has been seen millions of times and reported on by every media outlet around the world. Perhaps they should stop worrying about the nickels and dimes and start worrying about their reputation with customers. Yesterday I reached out to United Airlines and offered my services as head of my proposed Department of Common Sense and Decency. They have yet to respond to my offer. If they do respond, I'll add "CEO statement writer" to my list of proposed responsibilities as well.